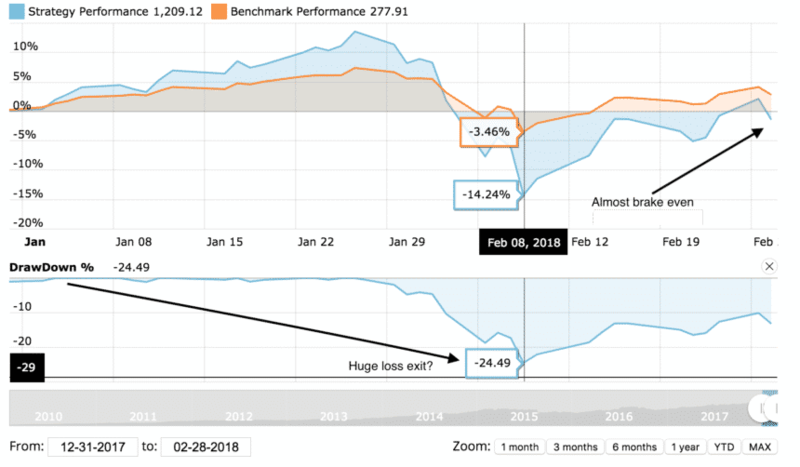 The NASDAQ 100 strategy with +4.55% return. The Universal Investment strategy with +1.45% return. The Global Sector Rotation strategy with +0.58% return. SPY, the S&P500 ETF, returned +1.79%. Strategy update: Our updated hedge now allocates to Treasuries, Gold or to a short US sector position. The hedge does not use currency ETFs anymore, which were conflicting with common 401k / IRA guidelines. February proved to be a difficult month. Although our last newsletter started with a word of caution, we were surprised by the unprecedented move that followed: The volatility index spiked in such a way that caused massive losses to some of the industry’s most popular volatility ETFs. Three major volatility ETFs were halted and two of them (XIV and SVXY) were permanently de-listed. We experienced the move first hand as we were trading VIX futures at the time. Our MYRS strategy, which is based on the ZIV ETF (VIX mid-term futures, 4th-7th month) took a large hit at -25%. The more popular XIV ETF (VIX front-term futures) lost more than 80% of it’s value and was withdrawn from the market (see Frank 2013 article : Why we invest in ZIV and not in XIV). The SP500 experienced a quick 10% fall but has partially recovered. Our strategies, except MYRS, have somewhat recovered, the worst showing a year-to-date performance of -3.92%. This number of course does not reflect what happened in reality as many investors considered exiting the market. And for good reason: UIS 3x saw a -25% drawdown from it’s all time high (-11.8% for the month) on February 8th. Today’s -3.92% YTD number seems manageable but only in hindsight. The return (with a vengeance) of volatility has somewhat obscured the continued weakness of the most important ETF for the month: TLT. The 30-year Treasury based ETF lost another 3% for the month bringing it’s YTD performance to -6.2%. This is worrisome as it adds to a treasury bear market scenario but also because treasuries did not react to the crash at all. The only ETF that moved opposite the equity market from Feb. 1 to Feb-8 was UUP, the dollar index ETF. ZIV itself is still at a loss and will continue to be until the term structure of volatility returns to it’s normal state (see our article ZIV/MYRS – how to go on after the crash). We would also like to remind subscribers that we do not recommend using the 3x leveraged strategies (ie, 3x UIS) while volatility sits at higher levels. Leveraged ETFs are ‘path dependent’ and may not perform as well in volatile sideways markets. As far as crypto-currencies go, not much to say as we wait to see if the correction has reached a bottom or is going to re-test lows. Notable is the acquisition of Poloniex by Goldman-backed Circle, which signals continued commitment by financiers to legitimate crypto-currency infrastructure. We wish you a healthy and prosperous 2018. Could you please say some more about how the hedging now works? Is there still a hedging sub-strategy that picks between 0% and 100% among a given list of defensive assets? How does it vary in how it’s used across the strategies? When are TMF or UGLD included? Personally, I’m sorry to see the currency ETFs no longer used (but I appreciate the problems with IRAs etc.). I really like your Gold/Currency strategy. It adds a lot of stability to just about any portfolio. However I have a problem trying to trade the Ultra Short currency portion of the trade. I have an IRA Margin account with interactive brokers, and it doesn’t let me trade CROC, EUO, or YCS. I was able to substitute DRR for EUO, but I can’t seem to find a substitute for Ultra shorting the Yen or the Aussie Dollar. Any suggestions? Once again I really like this strategy. Hi Kevin, we looked into all potential replacements for CROC and YCS, but the only ones out there have very tiny trading volume and also a different leverage. So we finally decided to replace the overall Hedge Strategy for our strategies from BRS/Gold-Currency into a new combined Hedge Strategy – which now excludes the FX portion and can therefore be traded also in IRA/401k accounts. You can see the new strategy using QuantTrader (Lite), download available here. For the benefit of followers who can use the leveraged FX ETF we´re not going to change the Gold/Currency strategy on the website.